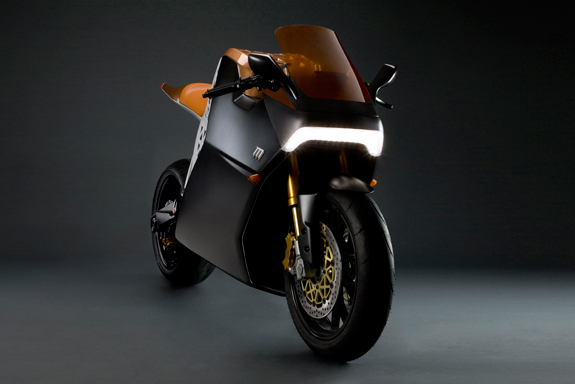 There’s an obvious dilemma for designers of a solar powered motorcycle: To charge a battery a motorcycle’s solar panels require surface area exposed to the sun; compared to a car (or a house) the surface area on a motorcycle is in short supply. The Spanish company sunRed developed an ingenious, if slightly ridiculous-looking, solution to that dilemma. 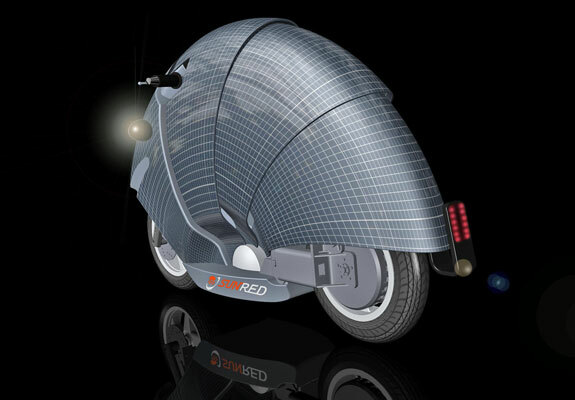 When the motorcycle is parked an arc of solar panels is raised over the motorcycle providing over 3 square-meters (25 sq. ft.) of solar paneling (while also causing the bike to resemble an armadillo with handlebars). 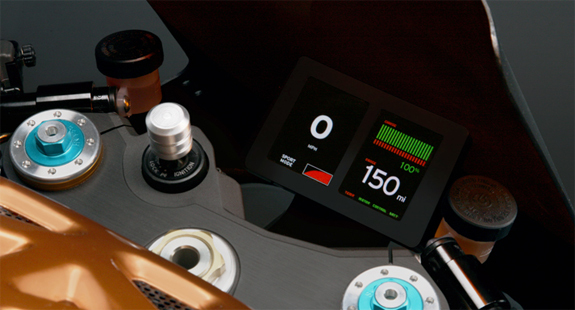 Fully deployed, the solar panels are capable of charging the motorcycle’s battery in about 2 1/2 hours. The panels also continue to work when the armadillo-cover is down, though at a greatly reduced rate. 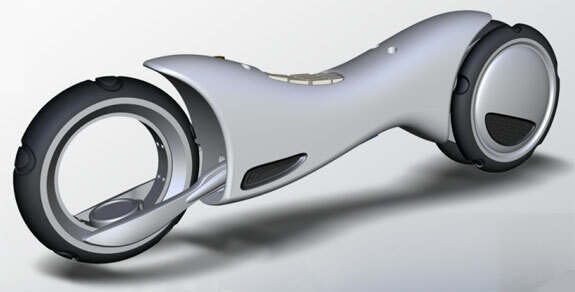 Though testing is still being conducted, it is estimated that the sunRed motorcycle will be able to go 20km (13 miles) at 50km/h (30 mph) on a single charge. With such a limited range we question whether there’d be a market for this product even in very sunny urban areas. 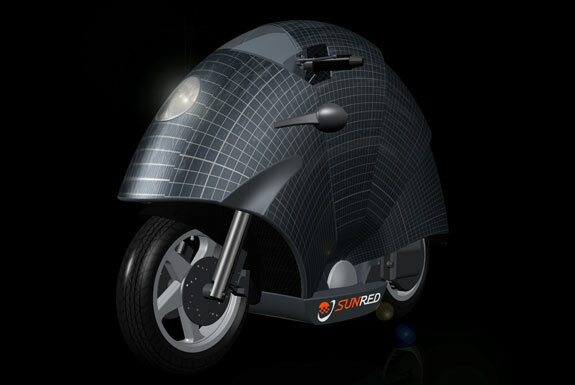 But there’s no question about this: the sunRed motorcycle would turn a lot of heads when it is parked. Development phase: Prototype built & being tested. 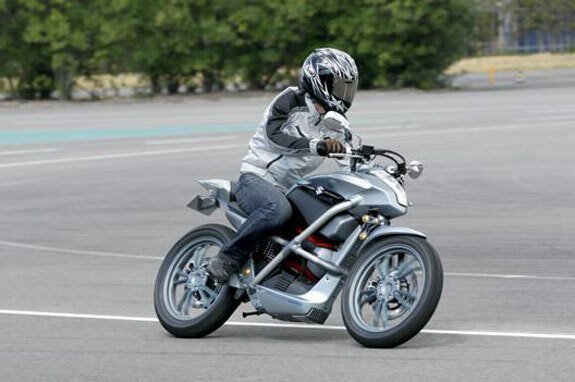 There are several advantages to using hydrogen fuels cells as a power source for motorcycles. The fuel cells are relatively small and light and have the potential, at least, of powering a motorcycle for a range exceeding that of today’s petrol-powered models. One major downside is that fuel cells are temperature sensitive—they can’t be exposed to temperatures below freezing and can’t get too hot. On a car there’s plenty of room to temperature insulate the cell. That’s rather more difficult on a motorcycle? 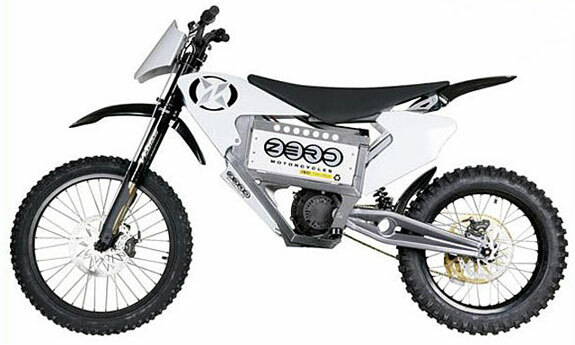 One company that’s developed a means of operating a motorcycle by fuel cell is Suzuki. Their Crosscage model has air-cooled fuel cells. The Crosscage has the power and equivalent to that of a standard 125cc bike; the estimated range is about 125 miles (200 km). No word yet on pricing or a possible release date. 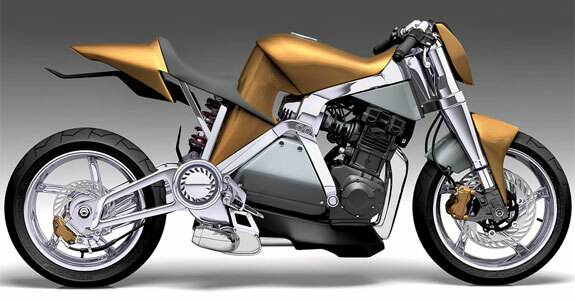 The ENV is a fuel cell powered motorcycle being developed by the British company Intelligent Energy, a company that is also working in partnership with Suzuki on the Crosscage (above). The ENV is inferior to the Crosscage in terms of the key specs: its top speed is 50 mph (80 km/h) and its range is 100 miles (160km). But then the ENV is further along on its development cycle. We also think it looks considerably better than the Crosscage. The ENV will first go on sale in England; the expected cost of a base model is a reasonable £4,500. 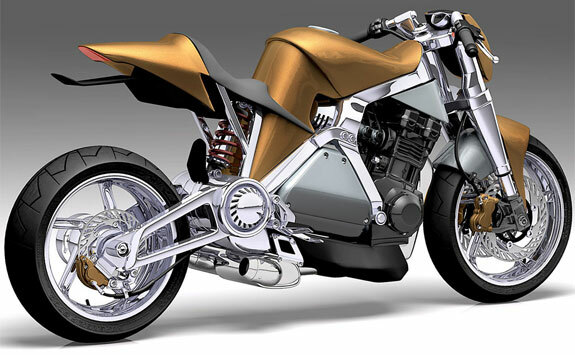 Australian Tim Cameron is one of the top motorcycle designers in the world, so it isn’t a surprise that his CAF-E cycle looks cool. In fact, for the CAF-E Cameron decided to reign in his usual outlandish style a little, so that the WOW of the design wouldn’t overwhelm the WOW of the engine technology. The technology includes a gas-electric hybrid drivetrain. Imagine the motorcycle equivalent of the engine that’s in a Toyota Prius. Except that the CAF-E has an electric supercharger along with its 180V lithium ion battery. Click on the third photo, below, for further info. 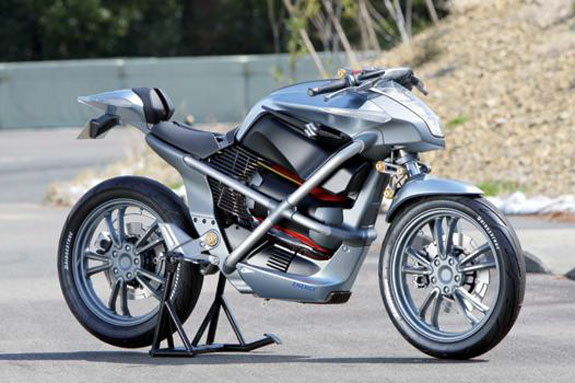 The Mission One is, by far, the world’s fastest production motorcycle. 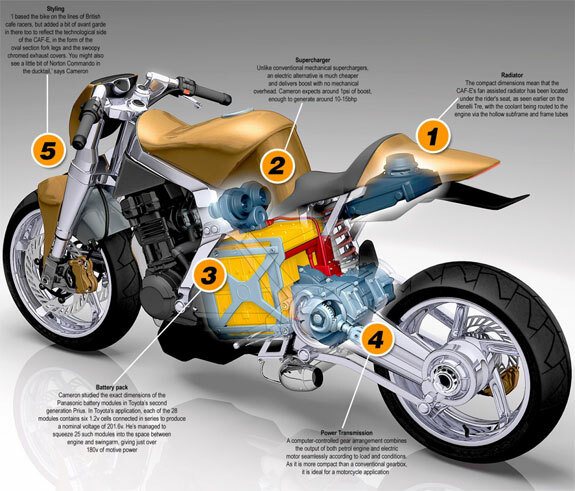 The engine is capable of kicking out 100 foot-pounds of torque, which propels the motorcycle forward at a speed of up to 150 mph (240 km/h). Though we have not ridden the Mission One up to this speed, much to our mother’s relief, we imagine it to be quite a surreal experience zooming down a highway at high velocity on a machine with an engine that makes no sound whatsoever. Indeed, the lack of engine noise combined with the lack of gears (electric engines don’t need any) might make the Mission One a disappointment to those expecting a traditional riding experience. Spot Cool Stuff is no such motorcycle purist. To us, the Mission One is a rather incredible technological accomplishment. And not only because of its headline-grabbing speed. To fully recharge the battery takes only two hours. On that single charge The Mission One has an average range of 150 miles (240 km). 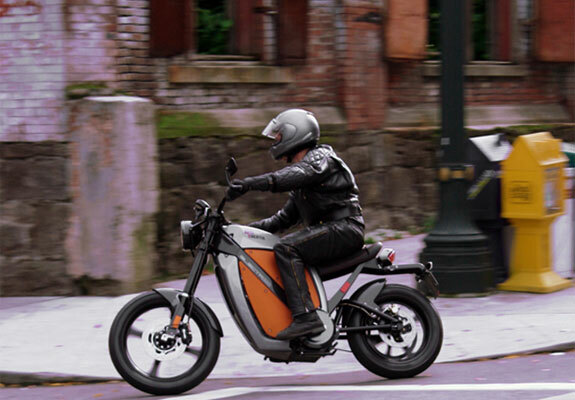 That range is actually higher driving in traffic since this motorcycle has a regenerative braking system similar to that on hybrid cars—every time you hit the brakes the motorcycle’s forward kinetic energy is captured and used to charge the battery. As if all that weren’t cool enough, the Mission One has wifi! Had Robert Pirsig owned a Mission One Zen and the Art of Motorcycle Maintenance would have been an entirely different book. Because the Mission One has not gaskets, timing belts, valves or spark plugs. It is all electronic. The engine’s computer captures all the data on its operation and communicates wirelessly with your computer. So, literally, you can tune up your Mission One while sitting on your computer. The Zero S isn’t as fast or cool-looking as the Mission One (above). Then again, it’s nearly 1/7th the price. 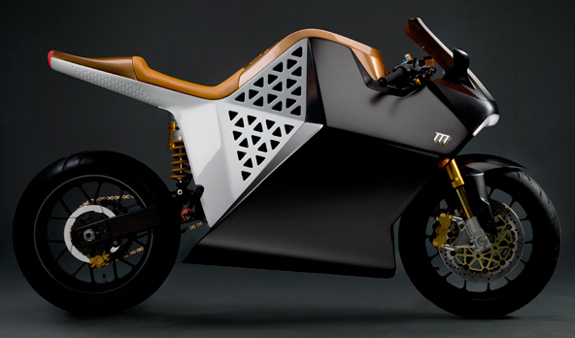 This bike, from California-based Zero Motorcycles, is constructed of aircraft-grade lightweight aluminum. Its engine puts out about 62 foot-pounds of torque and powers the Zero S to a top speed of 60 mph (96 km/h). It takes 4 hours to recharge the batteries, which give the Zero S a range of about 60 miles. Compared to a petrol motorcycle those specs are underwhelming. 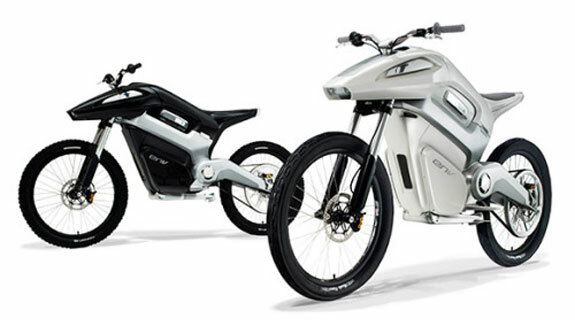 But as electric motorcycles go there are may be no other model with as much performance for the money. 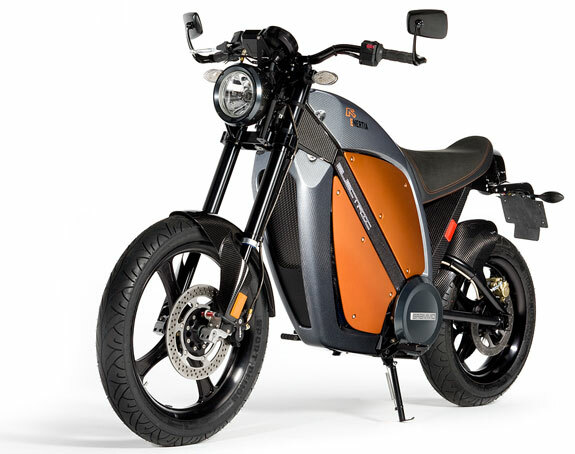 Unlike the other alternative powered motorcycles on this list we didn’t include the Enertia because of futuristic concepts, superlative build, top performance or cool looks (though we do think it has a snazzy design). We choose it because, if you live in the United States, this model from Brammo is the best alternative powered motorcycle you are most likely able to buy and use yourself. 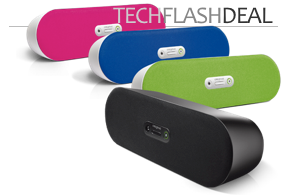 Starting in May 2009, five Best Buy stores on the west coast of the USA will be selling the Enertia. Though no official announcement has been made it is possible that some, most, or all of Best Buy’s other 1,200ish stores around the U.S. will carry the Enertia by the end of the year. Best Buy will even provide maintenance on the cycle through their partnership with Geek Squad. Also anticipated in the near future is a more powerful two-seat version. The one-seat Enertia produces about 28 foot-pounds of torque, has a top speed of around 50 mph (80 km/h), takes 3 hours to recharge and has a range of 35 to 45 miles (56 to 72 km). The Motivo is the motorcycle that isn’t always. The vehicle is built upon a modular base with a hubless, steerable wheel in the front and a fixed wheel in the rear (see photo, below). 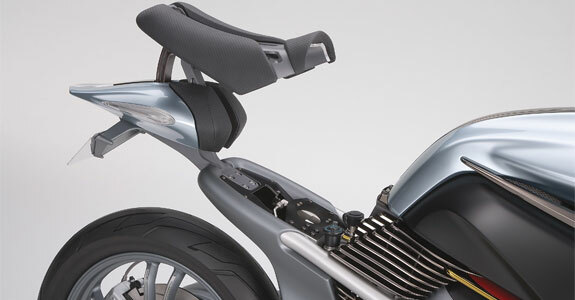 Attach a seat-and-handlebars unit upon one modular base and you have a motorcycle. Attach a two-seat-and-steering-wheel untit across two modular bases and you have a car. The Motivo’s design calls for lithium ion batteries that can be recharged wirelessly; there’s an extensive wish list of other geeky features too. Will the Motivo ever go into production? We doubt it. 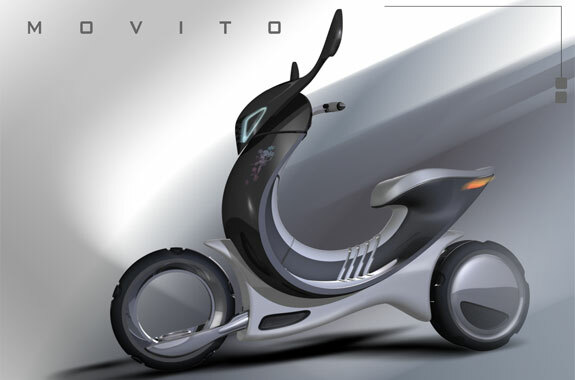 But the design was recently selected as a finalist for NASA’s Create The Future contest, a forum from which concepts enter the marketplace. We wouldn’t be surprised to see some version of the Motivo’s cool modular idea in use in the next decade. Really want the Mission One. These motorcycles are good for our environment but they still expensive.. They are expensive now, absolutely. New technology usually is. I can see prices coming down a lot once/if non-petrol-powered cycles catch on.